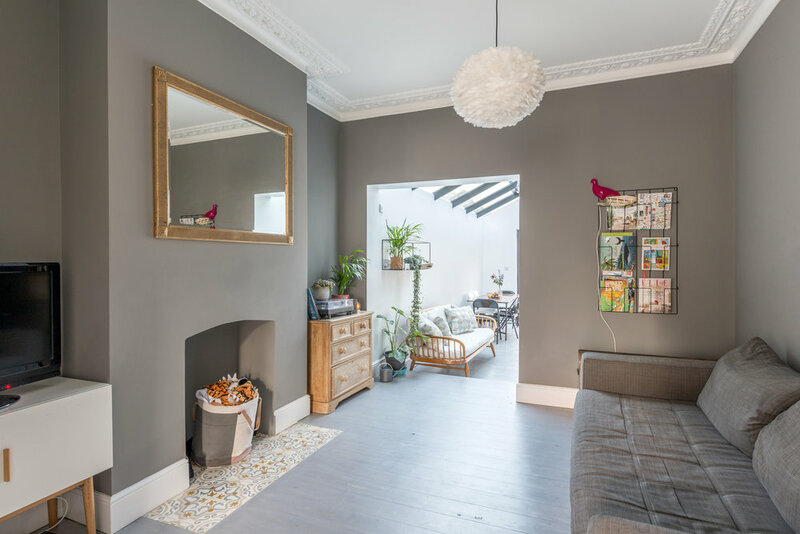 The clients required a whole-house overhaul of their existing property, a Victorian terraced house in North London, with a ground floor bathroom and third bedroom accessed off another room. The architectural design sought to address a number of points, including addressing the layout difficulties, full interior refurbishment and extension to the ground floor. The project included for interior design and consultation services throughout. This more specifically included the design, layout and specification of the bathroom including sourcing a bespoke steel framed shower screen, as well as concept design/layout of the kitchen to enable the clients to source their own units without engaging a dedicated kitchen designer. The client brief was for a strongly monochromatic palette into which colour accents could be introduced by means of family toys/objects, a variety of tiling features, and living plants. The extension work created a side infill with fully glazed roof to create a large family dining kitchen, accessed off an enlarged opening to the rear reception room, with a play area to the front of the house and a WC located under the stair from the hallway. At the rear this area opened up to the garden to create a truly open family space that flows naturally throughout the ground floor. At first floor the two main bedrooms were refurbished, with the addition of significant soundproofing to the master bedroom to resolve the acoustic issues often present in terraced properties of this age and type. The rear wing of the house had the internal partition walls removed to allow a new layout creating a home office/third bedroom and dedicated family bathroom with full width shower.